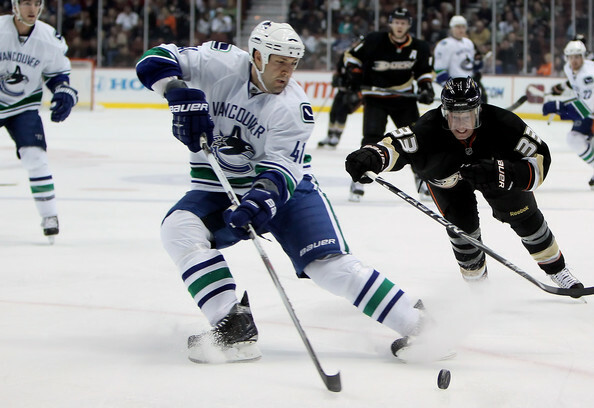 It's been an interesting year for Vancouver Canucks' defenseman Andrew Alberts, but after a strong off season training regimen, he is asserting himself on the Canucks' blueline. Last year towards the trading deadline, Alberts was dealt from the struggling Carolina Hurricanes to the playoff bound Vancouver Canucks - but the good news did not last. Alberts was an instant goat in Vancouver for frequent giveaways, poor defensive play, and horrible penalties that resulted in power play goals against, especially in last year's playoffs. "You're not playing your best, you're not happy about it and sometimes you hear about it from outside sources, like the media and people around town," Alberts said. "I wasn't really watching TV or reading the paper, but you hear stuff either way. "It was tough to go through, but I learned from it and I can use it as motivation." 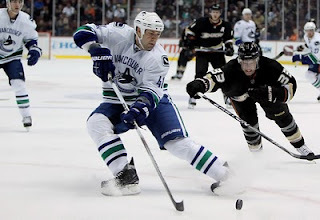 Were it not for constant injuries to their depleted blueline, the Canucks likely would not have dressed Alberts. This season however, Alberts came to camp ready to win a spot on the revamped defense that featured newcomers Dan Hamhuis and Keith Ballard. Pegged as the 9th defenseman at best behind Shane O'Brien and Aaron Rome, Alberts surprised many by beating both of them and winding up as the #6 after the injury to Sami Salo and the trade that sent O'Brien to Nashville. Many fans and media felt that this move was buoyed by O'Brien's $1.6 million annual salary compared to Alberts' $1 million, but Alberts has impressed many early in the season that suggests he may have one the #6 spot above the other based on his pre-season performance. Albert's ascent has continued as he has played well positionally, kept his game simple, delivered some punishing hits and even some timely offense with his opening goal against the Carolina Hurricanes last night. As the season progresses, the Canucks may move Alberts back down the depth chart based on the health of Keith Ballard and whenever Sami Salo may return. But until the likes of Ballard and Salo return, Alberts may continue to see his stock rise - and for that, the Canucks would be appreciative of the return on investment.